Tag Archive | "HKS 2530"
Twin HKS GT2530 for the Skyline RB26? For those of you who are not aware, HKS Turbos are re-branded Garrett Turbochargers which is also obvious as you can usually see “Garrett” stamped on the housing. The GT2530 are a direct fit bolt on up upgrade for the RB26DETT that are usually priced around $2000 ~ $2500 for the pair, so there not the cheapest upgrade options either. 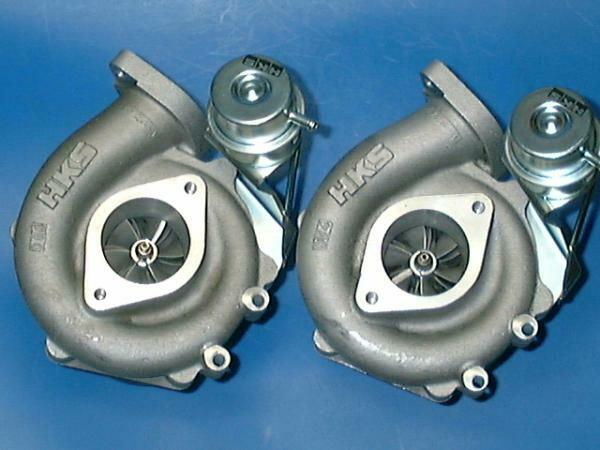 Build quality and the turbo design in general are amazing for the size of the turbo, we can tell that all HKS & Garrett has in mind when designing these was the RB26 as they will hit full boost by 4000rpm and hold nicely until redline, max boost for these is around 23psi and they have been knock to crack 550rwhp which even then is the max they will punch out. A tear down of a GT2530 will reveal the CHRA or Center is a Garrett GT2860 with HKS housing that are designed for better flow and the RB26, hence the quicker spool. The peace of mind you will get from a 2530 upgrade is knowing you will retain your stock reliability as they are manufactured better than OEM spec, depending on future mods this may or may not be the turbo for you, if you looking at retaining stock ecu and engine and planning on bolt on upgrades such as Inter cooler, Dump pipe and Exhaust then the GT2530 are the turbos for you, on the other hand if your planning on extensive upgrades like stroking, oversize valves and bump-sticks (camshafts) then you will be better off going down the T67 or GT40 path.